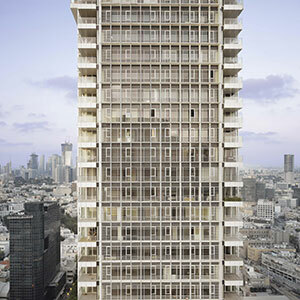 This unique residential tower is anchored to Rothschild Boulevard in the heart of Tel Aviv’s White City, a UNESCO World Heritage Site. The area is filled with thousands of Bauhaus buildings dating back to the 1930s and 1940s, designed by German Jewish architects who began immigrating to Israel before World War II. The prominent corner site is the intersection of the gracious civic promenade that is Rothschild Boulevard with the commercial corridor of Allenby Street. The Rothschild Tower is a simple, graceful 42-story residential tower, lightly resting on a retail base with connectivity to its own restored through-block retail arcade under the resident amenities, firmly embedding the building and its residents in the pulse of the neighborhood. It is designed with lightness and transparency, and Bauhaus principles in mind. For such a large building in a sensitive setting, lightness and transparency reduce scale and mass in the context of the low-to-mid-rise neighborhood.